iPhone 4 - Globe Pre-Order Registration Begins Today! 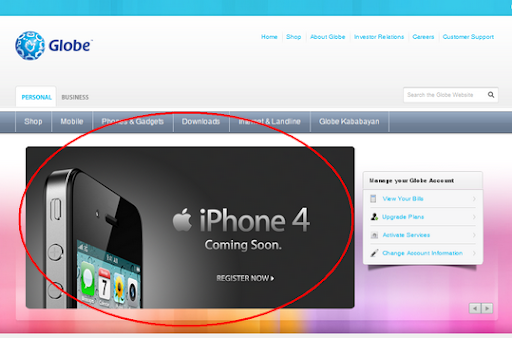 Yes, iPhone fans in the Philippines, Globe Telecom has just started iPhone 4 pre-order registration! So if you want to make sure that you will one of the first in the Philippines to actually own the latest smartphone by the Cupertino company, head on over to this page and sign up for your iPhone 4 now! ERRATUM: As it turned out, above-mentioned Globe iPhone 4 Registration Page is merely for registration of interest and not taking pre-orders. Read more about it via the link. Off hand, Globe doesn't make any mention of iPhone 4's pricing details nor actual release date in the Philippines (specifically as a Globe Plans handset) -- leaving us free to speculate on such matters. If you will, check out TP's iPhone 4 Globe Plans Price and release date speculation/estimation via the link. We the cooperative group still waiting for the issuance of tax exemption certificate.